You probably already know just how important your credit score is, and how this three-digit manifestation of your credit health can affect your life. Without a solid credit score, you may struggle to get your own apartment, buy a home, or finance a car, for example — and that’s just the beginning. If your credit has been damaged due to late payments, debts in collections, or neglect, credit repair may be exactly what you need. You can do the repair work yourself, or you can choose to hire a firm to help. A good credit repair company can work as your advocate, providing you with counsel regarding your credit score and how it’s determined. They also work to improve your credit score on your behalf, usually by negotiating with creditors and credit bureaus to remove negative marks, resolve issues and help you repair your credit — once and for all. Unfortunately, there are numerous credit repair scams to be aware of. Some credit repair companies will ask for money upfront before they have done any work to help repair your credit, for example, while others will ask you to take unethical steps, such as disputing information on your credit report that’s actually true. Another scam to be aware of is any time a company promises you a “new credit identity” or asks you to give false information. Fortunately, credit repair companies are governed by the Credit Repair Organization Act (CROA). This law requires credit repair companies to take certain steps such as informing you of your legal rights, giving you three full days to cancel your contract with them and letting you know the full costs of their services upfront. The law also gives you options if a credit repair company doesn’t live up to their promises, including the ability to sue them in federal court, the ability to seek punitive damages, and the right to join a class action lawsuit against the company. If you’re ready to repair your credit, a credit repair agency can help provided they are reputable. Keep reading to learn more about how these companies work and what to expect. What services do credit repair companies provide? While credit repair companies don’t have the legal power to do anything you can’t do yourself, they do play an important role for people who feel overwhelmed trying to fix their credit themselves. There are legitimate reasons consumers may turn to a credit repair company, including getting fraudulent accounts removed from their credit report amending mismerged credit accounts that belong to someone else, and accounts in bankruptcy that are misreported. Legitimate credit repair providers assist consumers by reviewing the consumer’s credit reports, identifying information which is adverse to the consumer, interviewing the consumer, and obtaining documents from the consumer to determine whether any of the derogatory information is false. From there, they typically prepare a letter to the credit bureaus disputing the errors. The dispute letter should identify the errors with specificity, briefly explain why the disputed information is false or misleading, and state what the credit report should say instead. While a dispute letter is almost always used as a measure to move toward better credit for the consumer, additional strategies credit repair companies take to fix their client’s credit can vary depending on their unique situation and their credit woes. They may help you get a copy of your credit report from the three credit reporting agencies – Experian, Equifax, and TransUnion. They will go over your credit report to determine what problems exist and the best course of action to fix them. They may help you utilize federal consumer protection laws to protect you and your credit from unfair debt collection practices. They may analyze your credit score and offer targeted information that can help you improve your credit score as you progress through their program. They may negotiate with your creditors on your behalf. They may dispute any information you feel is inaccurate on your credit report with the goal of having negative information removed altogether. Credit repair agencies may also help consumers fix incorrect credit limits that can inflate or skew credit utilization and adversely impact a consumer’s credit score. What credit repair companies won't do? While having a third-party company handle all your credit issues for you may sound ideal, it’s important to keep your expectations in check. Credit repair companies can absolutely help you improve your credit score over time, but they do have limitations. Credit repair companies cannot do anything you cannot do yourself. While credit repair agencies will work with your creditors and the three credit bureaus to improve your credit and have negative information removed, you can also take all of these steps yourself without paying for credit repair. You can also call up your lenders and negotiate with them yourself. You do not need a credit repair firm for that. In fact, many lenders may not even allow a third party to negotiate on the customer’s behalf. Credit repair companies can’t remove accurate information from your credit report — even if you pay them. While credit repair companies may work hard to get your credit report clear of any negative information, they cannot get accurate negative information removed from your report. Thanks to the fact credit repair organizations are overseen by the Credit Repair Organizations Act (CROA), they also cannot promise to have information removed from your reports. They may not offer budgeting or money management advice. While credit repair agencies have the goal of getting you out of debt and repairing your credit, they don’t offer the same services as credit counseling agencies. Credit counseling agencies offer a more holistic approach to solving your money and credit problems, focusing most of their efforts on helping you make a budget, manage money better, and reduce spending. Does credit repair work for everyone? Credit repair can help consumers boost their credit scores and get out from under their credit problems from the past. In that respect, yes, credit repair can work for everyone if you give it enough time. For the process to work, however, you need to work alongside your credit repair agency to make needed changes such as paying down debt and paying your bills on time. However, you don’t have to hire a credit repair firm to get your credit score back in good standing. It’s possible to dispute negative information on your credit report via the three credit reporting agencies yourself, for example. Petersen notes that most consumers who have a good faith dispute can write a brief letter identifying the errors, explain why the information is false or misleading, and inform the credit reporting agencies of what the corrected credit report should state. Consumers who take the time to write their own dispute letter may also see better results versus the results they may get when a credit repair company sends a generic letter on their behalf. You can also get a free copy of your credit report from all three agencies online for free from AnnualCreditReport.com instead of relying on a credit repair company to get your credit report for you. Last but not least, you can take steps to improve your credit on your own, including paying down debts in delinquency, making all your payments on time, and lowering your utilization by paying down the amounts you owe. The length of time it will take to repair your credit depends on a wide range of factors: this includes your current credit score, the severity of your credit issues and the amount of debt you have to pay off. If you want to get a general idea of how long it will take for credit repair to work, your best bet is speaking with a knowledgeable credit repair agency to see what steps they need to take and a general timeline for their services. While credit repair agencies may not be able to tell you exactly how long it will take to repair your score, their experience in this field may put them in a position to give you a general idea. How do I know if a credit repair company is safe? Since the Credit Repair Organization Act oversees credit repair agencies and sets rules to govern what they can and cannot do, you do have rights when it comes to credit repair. According to the CROA, credit repair companies must explain your legal rights in a written contract along with details of the services they’ll perform. They must also inform you of your three-day right to cancel without charge, and let you know approximately how long their services will take. Last but not least, credit repair agencies must inform you of the total cost of their services in writing. If a credit repair agency doesn’t offer this information, you should steer clear of them altogether. While credit repair companies can take care of the bulk of your credit repair for you, they can’t do anything you can’t do yourself. The Federal Trade Commission (FTC) offers a multi-step process to repair your credit on your own. Not only do they suggest ordering a copy of your credit report for free at AnnualCreditReport.com, but they suggest disputing errors on your reports directly with the credit reporting agencies. Other steps you can take to improve your credit include paying all your bills on time (perhaps setting up payment reminders to expedite this) and lowering the total amount of debt you have. Paying off any late or delinquent debts will also help boost your score. 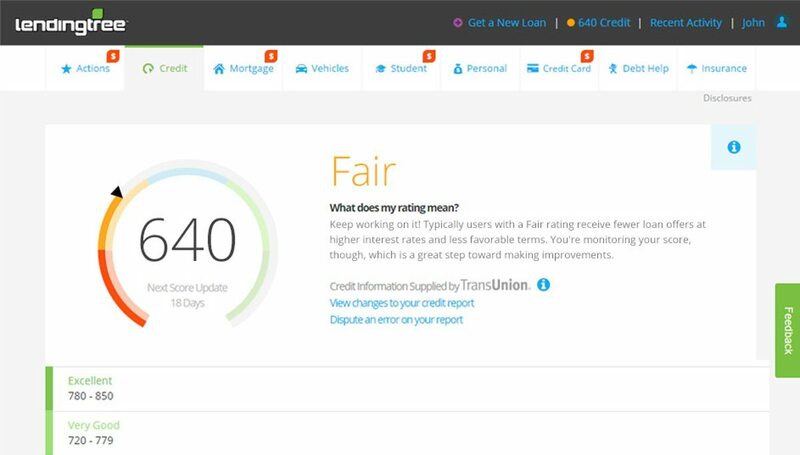 Does checking my credit hurt my score? Checking your credit score doesn’t hurt your score. You can get a free estimate of your credit score on LendingTree at the bottom of this page within a matter of minutes. You can also get a free copy of your actual credit report from the three credit reporting agencies — Experian, Equifax and, TransUnion — once per year on AnnualCreditReport.com. How long does negative information stay on credit reports? According to credit reporting agency Equifax, accounts paid in good standing tend to stay on your credit report for 10 years. Negative information on your report tends to stay there for seven years. However, revolving debts and installment debts with a previously late payment history usually stay on your credit report for up to 10 years, although the late payment history can be removed after seven years. What should you do if you encounter a fraudulent credit repair agency? The FTC notes that it’s important to report fraudulent or shady credit repair agencies to the appropriate authorities. They suggest contacting and making a report with your state attorney general or filing a complaint with the FTC. You can also call the FTC help line at 1-877-FTC-HELP. Should you also consider a credit counseling agency? If you’re struggling with debt and the effects of poor credit, working with a credit counseling agency can also help. These agencies, which are normally nonprofit, work with you to manage your debts and get on a monthly budget. They also discuss your entire financial situation with you in an effort to pinpoint the personal struggles you have with money along with potential solutions. How is my credit score determined in the first place? Your credit score is determined using several factors, the most important of which include your payment history and the amounts of money you owe. The myFICO.com website notes that your payment history makes up 35 percent of your FICO score and that your utilization (amount of debt you owe compared to your credit limits) makes up another 30 percent of your score. Other factors impacting your credit score include the length of your credit history, the amount of new credit you have, the mix of different types of credit you carry. I hear that credit repair agencies aren’t always reputable. What are some of the signs of a scam? As the FTC notes, some of the most common signs of a credit repair scam include: a company asking you to pay for their services upfront; a company telling you not to contact the credit reporting agencies yourself; companies telling you to dispute accurate information on your credit report; any company asking you to give false information; and companies that don’t explain your legal rights upfront. At LendingTree, we want to help you monitor and improve your credit. Each month, we’ll give you your credit score for free in addition to evaluating your credit score and current debt to see if there is any room for savings. If we find savings, we’ll send you an alert via email.